We began our two-week journey to Tanzania from our home in Cincinnati, where we took a plane to Boston, then changed to an overnight flight to Amsterdam. (The least said about trying to sleep on a crowded plane, the better.) After a too-short time in Holland–a country we both would like to see someday–we boarded one more plane for a nine-hour flight to Kilimanjaro Airport, outside of Arusha, Tanzania. Arriving at Kilimanjaro after dark, we were met by our guide, Zepha Mofulu, and the operator of Flash Safaris, Magda Vrijs, who bundled us into the safari vehicle and whisked us off to Ngare Sero Mountain Lodge at the foot of Mount Meru, where we would stay the next two nights. Our companions, Kim and Terry from San Diego, had been there for 24 hours already, and they waited for us to arrive to have dinner. 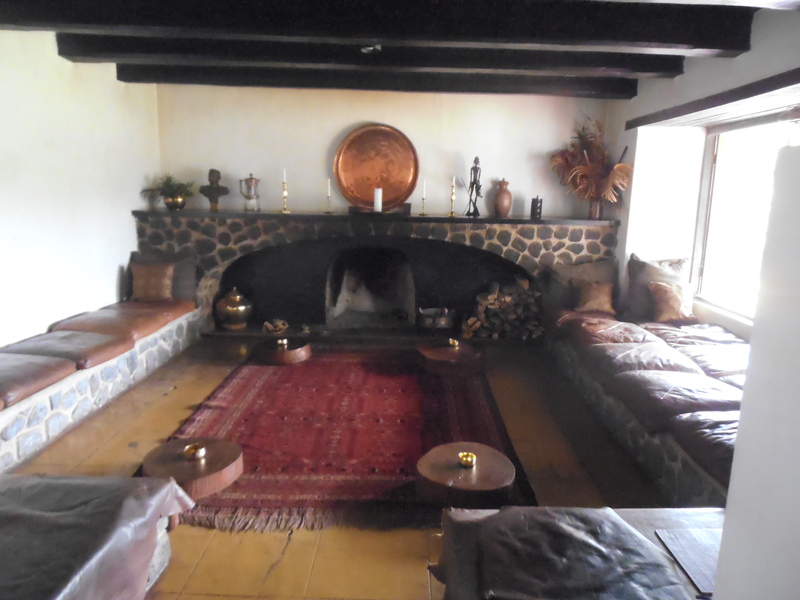 The staff served us in a lovely dining room, starting with homemade soup, which we came to learn would be the beginning of every evening meal. Since Steve and I both love soup, that made us very happy. The meal was quite good, but we soon needed to drift to our room, as jetlag was taking hold, and we would need to be up early enough to have breakfast and get on the road to Arusha National Park with Zepha. Our room was lovely. We had a sitting room, bedroom, and an enormous bath, complete with private water closet, dressing room, and a huge tub. We didn’t have much time to enjoy it, or even take photos, since we pretty much crashed that first night. 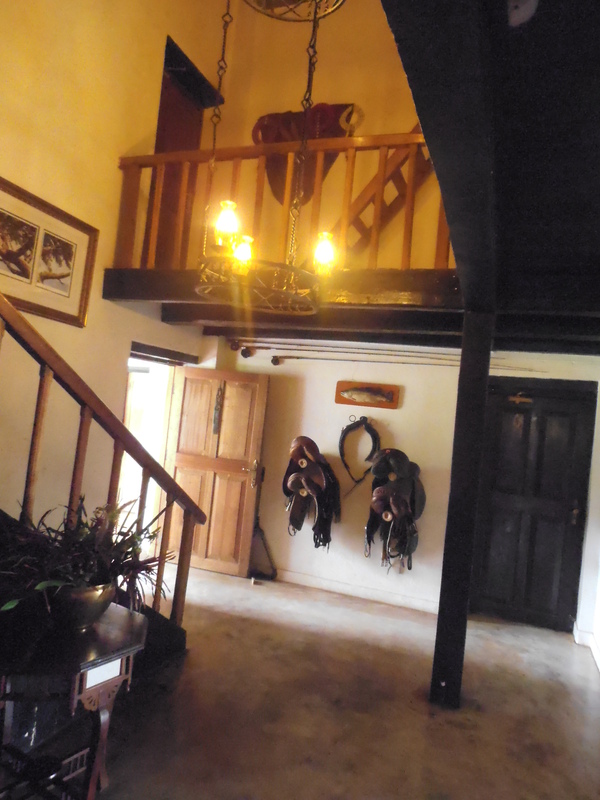 The lodge has a lot of history. 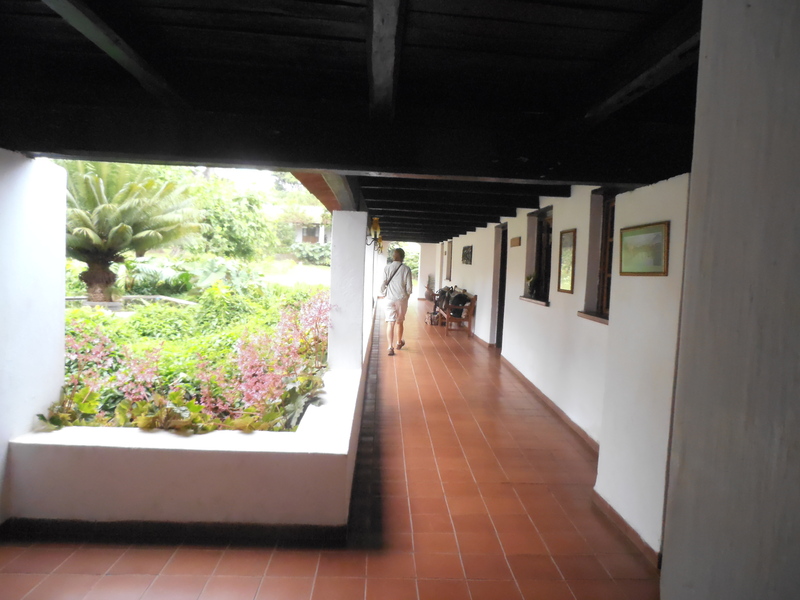 It was built in 1905, originally as a defensible homestead and outpost for the family of a German named August Leuer. 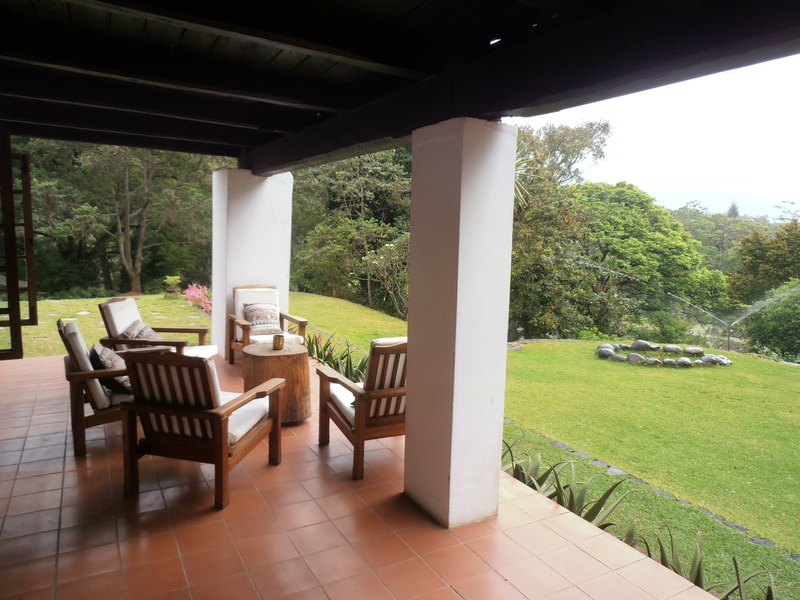 He bought the property 20 years previously, when he originally went to East Africa as part of a military expedition. He grew coffee and other crops here, and developed an ingenious water turbine and other innovations, still in use today, which make the operation largely self-sustaining. 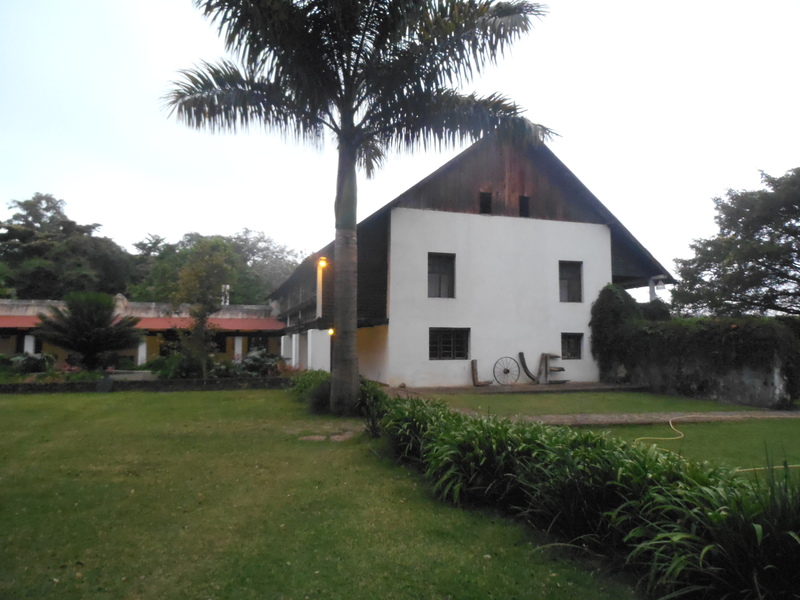 You can find more information and photos on their website: Ngare Sero Mountain Lodge The second owner of the lodge, Mike Leach, is still in residence, as are some members of his family. They are gracious hosts, willing to share information about the history of the place, the animals that live there, and the philosophy behind their sustainability policy. And they make darned fine coffee. 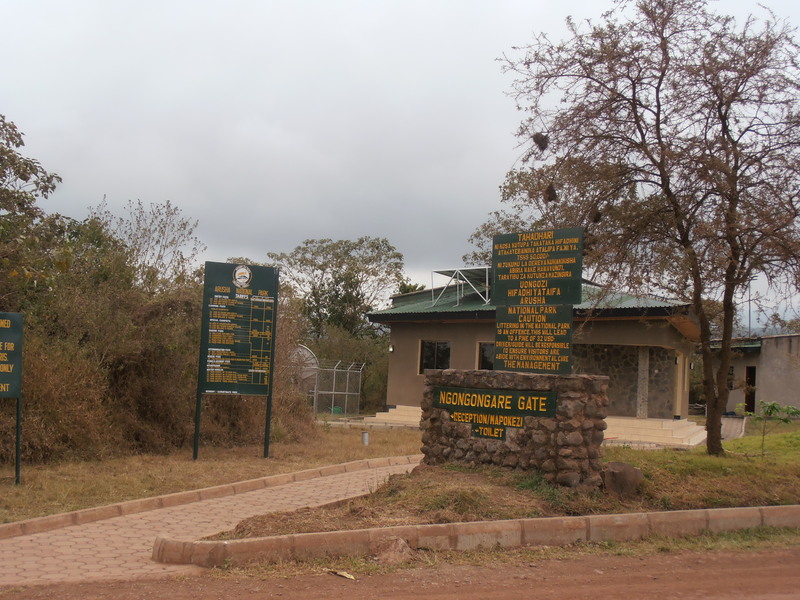 One of the entry gates to Arusha National Park. Weaver nests in the acacia tree to the right. Our first day of safari took us to Arusha National Park, one of the smallest of all the national parks in Tanzania, but home to some of its most colorful wildlife. We were fortunate enough to see a colony of colobus monkeys, high in trees above us, on a quiet road. We sat beneath them for quite awhile, watching as they tended each other. Kim is an aviculturist with the San Diego Sea World, and she was overjoyed to see the hundreds of thousands of flamingos in Lake Momella. The lake was, literally, rimmed with a solid line of pink from all the birds settled along the edges. 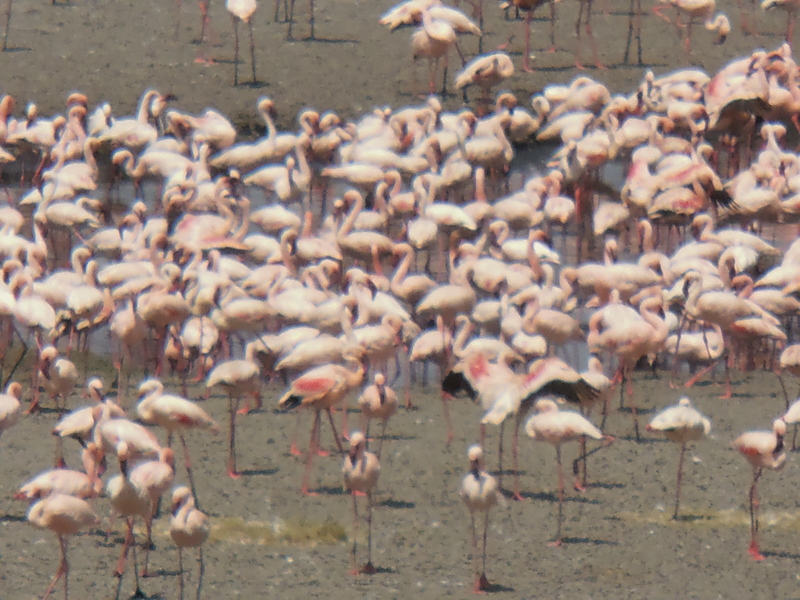 Flamingos travel from lake to lake in search of food, and we were quite fortunate to catch them when they were here. We saw a large number of baboons here, which are quite frankly an assault on the sense of smell. I could tell they were present by their musky odor during the entire trip. This area had the most of anyplace we visited, and we were able to see them quite close, as they were on both sides of our stopped vehicle. I took a bunch of closeups of one male baboon but it wasn’t until I looked at the photos here at home that I realized they were most definitely X-rated. 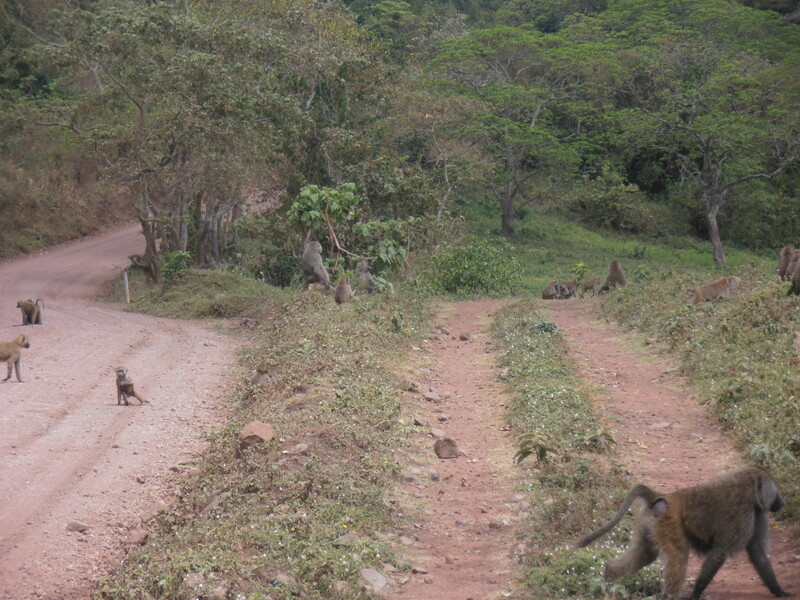 Troop of baboons crossing the road in front of our safari vehicle. 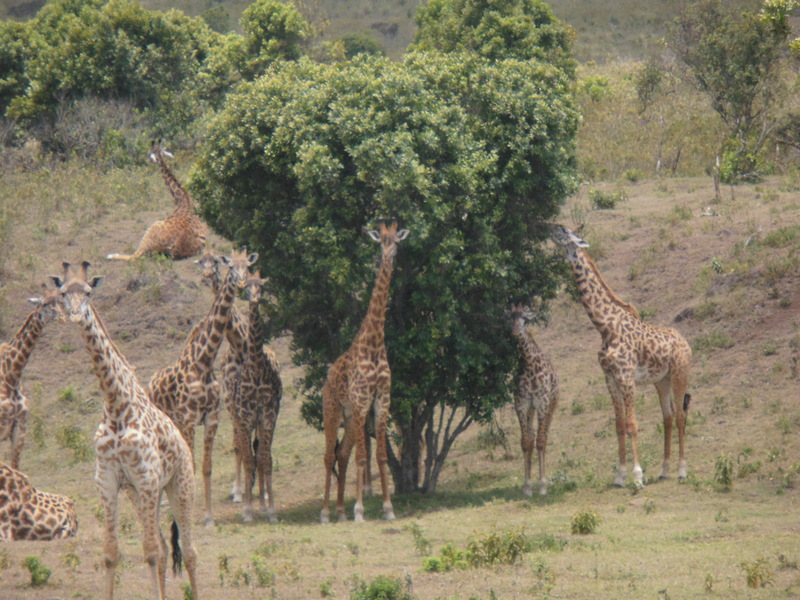 One of my favorite sightings of the whole trip was in this area, where we saw dozens of giraffes feeding, resting, and just standing around. They are such amazing animals. Seeing them rise to their feet from a seated position, or lowering into one, fascinated me. Our guide told us they cannot let their heads go sideways, as their necks are not strong enough to lift them again. They eat mainly the leaves of acacia trees, stripping them from the thorny twigs with their black tongues. Clearly, an especially tasty acacia tree. There were lots more animals here, including zebras, Cape buffalo, warthogs and lots of birds, but I ended up coming down with something (which I later realized was a reaction to the anti-malarial drug we were taking) and could barely take it all in, let alone photograph them. We did see one of the most memorable birds of the whole trip here–among the more than 230 species of birds we saw in the 12 days–the cinnamon-chested bee-eater . I could never get a photo of one, although Steve and Terry both did. We saw other species of bee-eaters, as well, including the little bee-eater, and the European bee-eater. Birdwatching in Tanzania was grand fun, and such a treat for the four of us; there are close to 1,400 species of birds there, and our guide was an avid birder who was brilliant at spotting new species for us. The weaver nests in the photo of the park gate above were just a tiny sampling of the thousands we saw. Tanzania has some forty species of weaver, each making a uniquely different type of nest, so nearly every type of terrain hosted at least one kind of weaver bird. 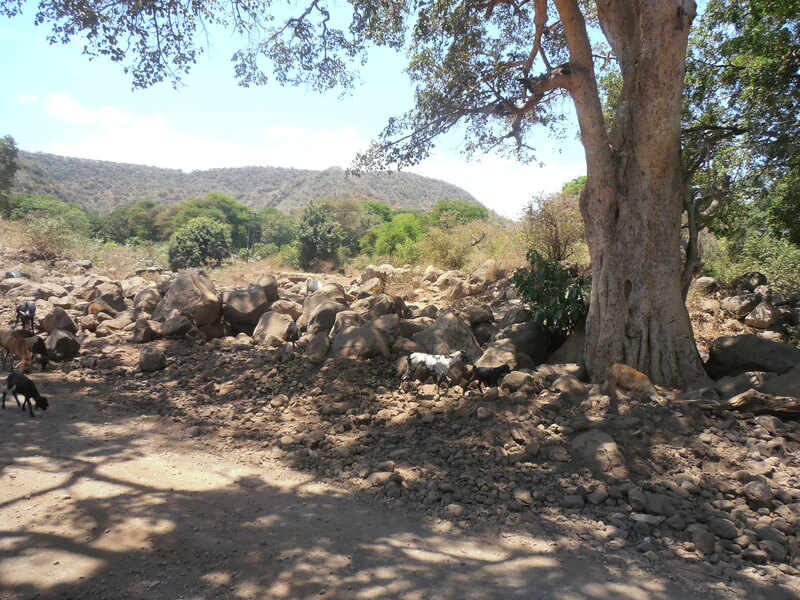 After two nights in Ngare Sero we piled into the vehicle and headed out for the drive to the Manyara National Park area. On the way we passed colorfully dressed Maasai people, including children as young as age six, herding cows, goats and donkeys. Some of the animals were quite close to the road, as were these goats. 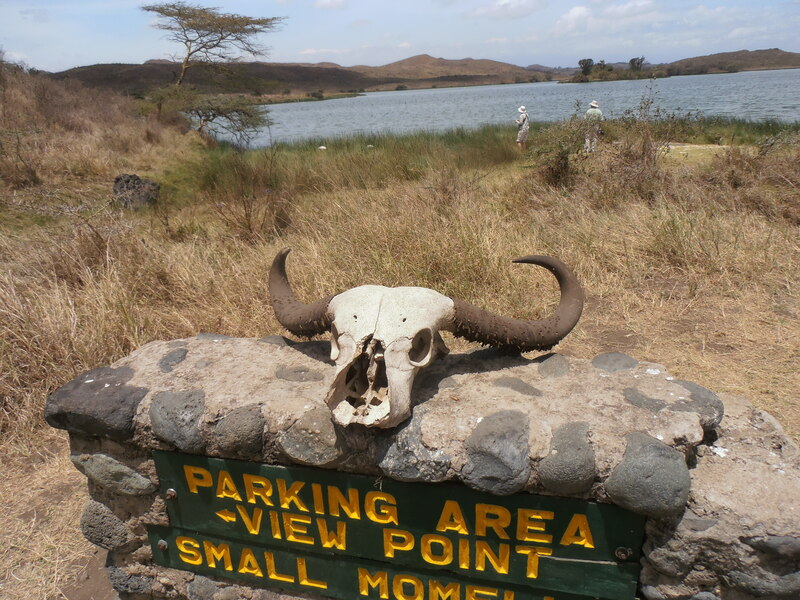 We could also see Mount Kilimanjaro and Mount Meru along the way, looming above the plains in the great Rift Valley. 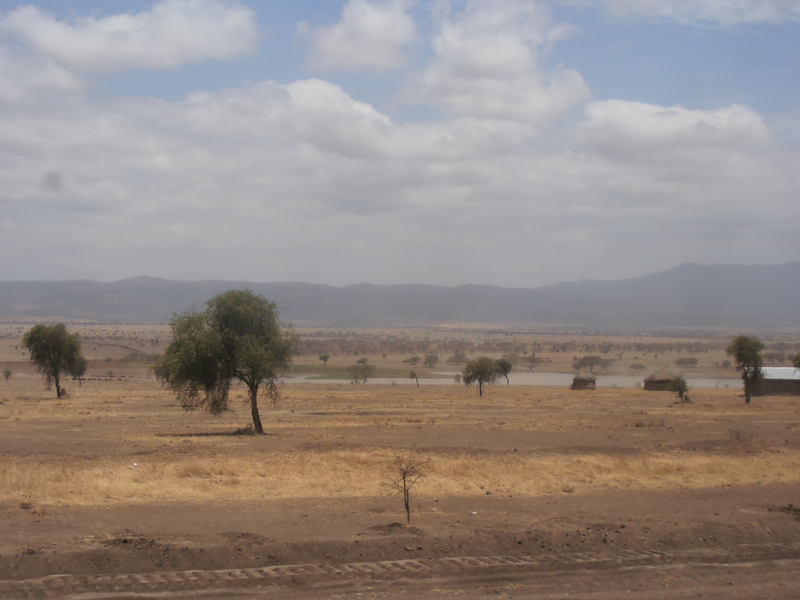 The landscape changed here, from hilly, with red clay soil, to flat, dry and incredibly dusty. On the road between Arusha Town and Manyara National Park. Our next stop, Kirirumu Manyara Lodge, where we would stay in our first tented camp. Watch for Part II of our adventures, coming soon. December 1, 2013. 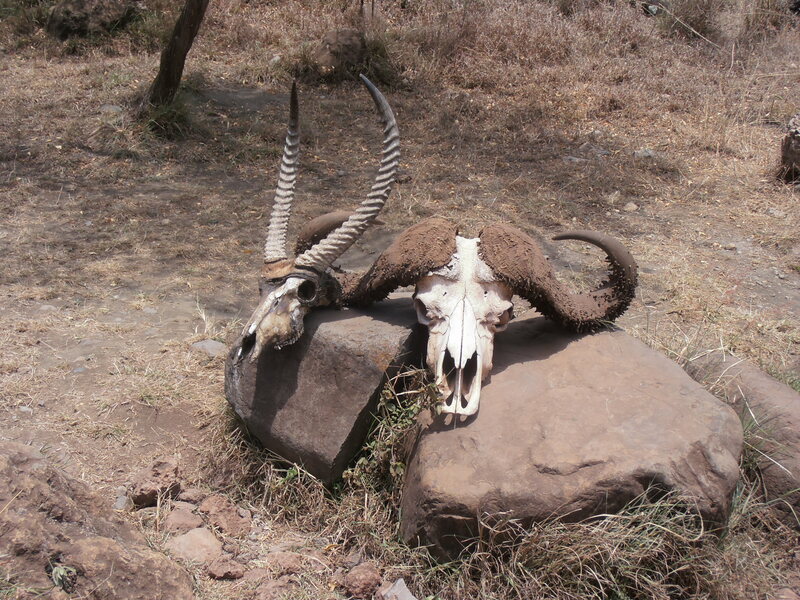 Tanzania Safari 2013.